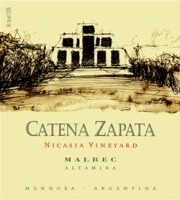 95 points Jay Miller (Wine Advocate): "The Catena Zapata icons begin with the 2008 Nicasia Vineyard Malbec, which spent 18 months in 100% new French barriques. A glass-coating opaque purple/black, it offers up a super-fragrant nose of toasty new oak, earth notes, exotic spices, black cherry and black raspberry. This is followed by a plush, layered, intensely flavored, rich wine with potential complexity, precision, balance, and a seamless finish. Give it 4-6 years of cellaring and drink it through 2028. (Dec 2011)"